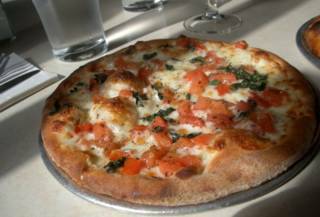 Since our first visit to Amici's back in May, Fred and I have become real fans. The service is efficient friendly and fast, making a great place for a speedy no-fills lunch. We love the mini sized pizzas, exactly the prefect amount for one person. The pizzas are tasty and the thin crusts are consistently of great quality. Fred nearly always chooses a pepperoni whilst I fluctuate my choices between the margherita (no sauce), the margherita with extra Boston fried eggplant topping or the Trentino which is a piquant little pizza with Mozzarella, Parmesan, Crumbled Feta, Baby Spinach, Pancetta (Italian Bacon), Red Onions, Herbs, and Lemon Infused Olive Oil, again no tomato Sauce. The pizzas are always cutely served each on a little metal tray with an extra plate for eating off of. After the battering I have had from my office mates for dining at California Pizza Kitchen from time to time, F and I decided to try Pizza at another locale, Amicis in San Rafael. The pizza's at Amicis have a nice thin crust, good choice of toppings and, best of all, come in a mini 7" size which is a better choice for your wallet, your waistline and the environment. I really can't say if you're moving in the right direction here. I'm completely burned out on CPK, and Amici's has always been pretty blah to me. Domino's -- they are the geniuses behind the heat wave. maybe they should be put in charge of the Mars Rover. When we move to the Presidio A16 should take the place of Amici's. You'll be one happy camper, Sam. is that related to mulberry pizza on smith ranch road here in marin??? ?